How to have multiple working options in a multidropdown & multidropdowns filtering each other? Hi, I’ve built a basic search function but just want to know whether the features I need from bubble are possible to me before I jump in on a plan. Is it possible for the repeating group to display results that have either one of the options, or multiple from each dropdown attached to them? In my database I have a “Game” data type with the Platform, Release year, and Game mode filters being Fields under Game - all as lists of text. 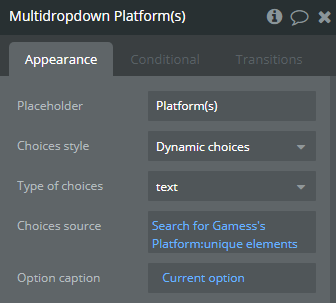 Additionally, as I plan to add one or two dropdowns which will have many (one with potentially upwards of 100) tags in it, is it possible that the dropdowns can filter one another based on which options remain from what has already been chosen? 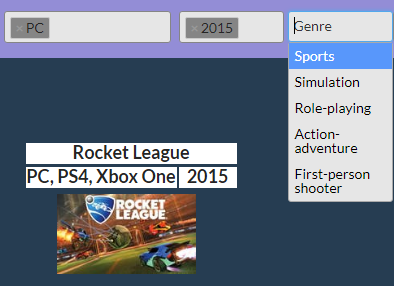 For example, if someone selects PC as a Platform, and 2015 as a release year, any options that already do not fit these filters will be eliminated - such as in the attached image example, all other game modes besides “Sports” shouldn’t be selectable anymore - and the relevant options can either be removed or greyed out from the other dropdowns. If you can point me towards the correct documentation or any videos to watch to solve this that would also be great! Thanks a lot in advance! In your app, you could keep Genre and Release Year. Then rename the “Movie” data type to “Game”, and rename “Streaming Service” to be “Platform”. I think that should give you very similar results but let me know if not! However, there are two related things I was wondering about. First off, is it possible to auto-link some of the data types with lists/things to avoid having to make multiple duplicate entries under each data type? For example, I have the “Game” section which is connected to all other data types (platform, release year, genre etc.). But then I also have each of those data types, to which I need to connect the name of every game to each relevant genre, year, and so on. Is it possible that when I select a certain genre for a specific game, the database automatically also adds the game to the relevant genre’s game name field? Apologies if that’s confusing! If you need screenshots I can upload some to make it clearer. Secondly, as some of the dropdowns will have dozens of options, I was wondering if it’s possible for the search to automatically grey out or hide options that when added to the search won’t result in a title being shown. For instance, if someone selects “First person shooter” from Genres, it shouldn’t show the option for “Family friendly” from the Tags input, as there will be no title present with both of those conditions. Ideally, as each input is added from a dropdown all other dropdowns should update and grey out or hide irrelevant options until the whole search is reset or options are individually removed - I don’t want to give people the option to make pointless searches which will otherwise be fairy easy as many combinations will end up in no results being shown. I’ve seen the greyed out fields in some paid plugins but after doing some digging couldn’t work out whether this is possible in vanilla Bubble.